“We learn from Wikipedia that the image on the door is the “semi-official” insignia of the 36th Waffen Grenadier Division of the SS…” and also pointed out the neo-Nazi significance of the number “1488”. Problem solved? Maybe not. Maybe it’s more like “Problem dodged”. 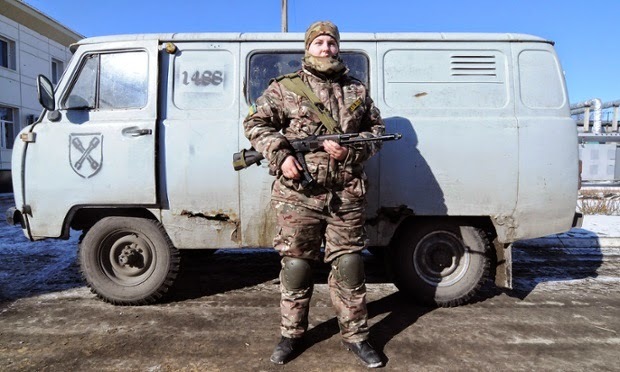 Specifically, the problem of the pervasive participation of “ultra-right” paramilitary elements in Kyiv military operations, which even intrudes upon the Guardian's efforts to put a liberal-friendly feminist sheen on the debacle of the recent ATO in eastern Ukraine. Neo-Nazis often combine the number 14 with 88, as in "14/88" or "1488". The 8s stand for the eighth letter of the alphabet (H), with "HH" standing for "Heil Hitler". Lane's death touched off paeans from racists around the country and abroad. June 30 was designated a "Global Day of Remembrance," with demonstrations held in at least five U.S. cities as well as England, Germany, Russia and the Ukraine. Judging by this video, the march/memorial on the first anniversary of his death, in 2008, organized by the Ukrainian National Socialist Party in Kyiv, was well enough attended to merit a police presence of several dozen officers. The sountrack to the clip, by the way, is an elegy to David Lane performed by Ukraine's premier white nationalist metal band at the time, Sokyra Peruna. You know that the three greatest movements of the last 2,000 years have been Islam, Christianity and Judaism. Judaism allowed Jews to conquer and rule the world. I believe only a religious fervor can save our kind now. The 14 Words must be a divine command of Nature's God whom we call Wotan Allfather. One of the awkward facts of Ukrainian politics is that Ukraine’s fascists have the ambition if not yet the demonstrated capability of opportunistically using the current regime’s need—and factions’ desires--for effective armed formations to catapult the extreme-right into power. And it isn’t going to be solved by ignoring, downplaying, wishing away, or dismissing Ukrianian fascism as an irrelevant historical and political anachronism...or by discretely recaptioning some of its embarrassingly blatant manifestations. I'm trying to avoid the TL;DR trap so I abridged my original piece to supply the excerpt posted above. But I try to err on the side of inclusiveness and context whenever I can--especially since sources vanish off the web and the Google algorithm sometimes gets dodgy--so I've included the complete original piece below the fold for readers who wish to go deeper. To paraphrase Rodgers and Hammerstein, How Do You Solve a Problem Like Anaconda?...and the appearance of the motto of America's premier white nationalist, David Lane, in a puff piece on the Ukrainian paramilitaries? “We learn from Wikipedia that the image on the door is the “semi-official” insignia of the 36th Waffen Grenadier Division of the SS…” and also pointed out the neo-Nazi significance of the number “1488” by citing Wikipedia. "Anaconda alongside a van displaying the neo-Nazi symbol 1488. 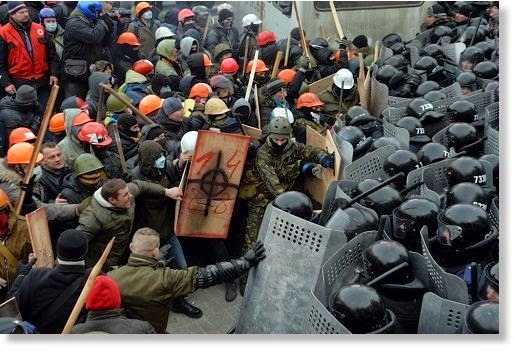 The volunteer brigade is known for its far-right links." Well here we are locked down again, or I should say as usual. Probably for a looong time this time. They still punish 800 innocent for what a few do. The American way I guess. Before I forget, the 19th book to contain David is the 38th book overall, Zechariah. There are 1938 words in the 1st five chapters and word # 1938 is base as base of a pyramid. In chapter 6 verse 12 is the capitalized word BRANCH. Zechariah has 14 chapters. It is an awesome responsibility you have undertaken. You might want to print up something of your own writing on the vital necessity of our Wotanism teachings. Also that Carl Gustav Jung said that Wotan was a dormant psychic force within the Aryan subconscious that might awaken when needed. The main Ukrainian ideologue for Ukraine’s academic/historical/cultural/theoretical variant of fascism, Yuri Michalchyshyn was a stalwart of Oleg Tyanbok’s Svoboda Party, which itself grew out of the Social Nationalist Party which organized the David Lane observance in Kyiv and spawned the C14 armed formation. Michalchyshyn established an institute whose first name, the Joseph Goebbels Political Research Center, unsurprisingly attracted a lot of unfavorable attention. He renamed it and, in October 2014, resigned from the Svoboda Party. This might be considered a reassuring harbinger of the mainstreaming of Svoboda which, after all is a key leg of the political troika supporting the US-backed regime…except for the fact that Michalchyshyn was resigning to take the position as head of the propaganda and analysis department of the Ukraine Public Security Bureau or SBU. … Avakov and his advisor Anton Gerashchenko, still supported Bilets’ky unofficially, and he was elected into the parliament in a single-member district in Kyiv. After the elections, Avakov appointed Vadym Troyan, deputy commander of the Azov battalion and a top member of the PU, as head of the Kyiv region police. Today’s involvement of the PU leaders in Ukrainian police seems to be driven by Avakov’s trust in the organisation that he worked with in the past. Avakov also seems to believe in the personal loyalty of the PU-led Azov battalion and may use them as his “private army” to protect his business and political interests. The problematic relationship between the Ministry of Inferior and the neo-Nazis is undermining the credibility of the newly formed Ukrainian government both internationally and domestically. It was most likely Avakov who suggested to Poroshenko to grant Ukrainian citizenship to Belarusian fighter of the Azov battalion Sergey Korotkikh who had been involved in the neo-Nazi movements in Belarus and Russia since the late 1990s. Furthermore, under Avakov, the police in Kyiv have already proved unable or unwilling to investigate a number of hate crimes. …There is no ground to believe that the infiltration of the far right into the police will contribute to the efficiency of its investigations in general and of the hate crimes in particular. The current Ukrainian government is unlikely to serve as a focus of loyalty for the ultra-rightists given the undercurrent of anti-Semitism that informs much of the fascist worldview (but remains submerged in focus on the Russian threat and due to the fact, indeed, that in many cases Jewish oligarchs are bankrolling the far-right paramilitaries). The president, Peter Poroshenko is sometimes accused of being a crypto-Jew whose real name is Walzman; the most active oligarch mobilizing money and muscle to roll back the pro-Russian presence in eastern Ukraine (and the financial force behind the Azov Battalion) is an oligarch of Jewish descent, Igor Kolomoisky; Victoria Nuland, the alleged Maestra of Maidan (the coup, anyway) is Jewish; and so on. There is also virtually no fit between the Ukrainian ultra-right and the Maidan dream of European integration that excites and motivates Kyiv’s backers in the West. *Some versions of the name’s origins emphasize that “c14” looks a lot like the Cyrillic letters spelling out “Sich” —the name of a force of Ukrainian nationalist riflemen that served in the Austro-Hungarian in World War I. “Sich” itself was the name for an independent Cossack encampment, one of which excited the admiration of 19th century Ukrainian nationalists because it resisted Russian penetration into Ukraine before it was destroyed in 1775. One could also add in the popularity of “C18”, the British white supremacist armed formation, which calls on, again, numerology: 18=A & H = Adolf Hitler. I’d guess it’s a combination of reasons as befits the syncretic character of Ukrainian fascism, but with the David Lane factor predominant. Portrait of Anaconda by Jonathan Alpeyrie, Transterra Media. I've been unable to locate a credit for the image of the 1488 shield. I originally saw it here. You make out the Ukrainian far-right as a national instead of a regional movement. Their members come from all over but their political base is quite concentrated in former East Poland. Past vote results for Freedom Party reflect this. Are you looking to earn cash from your traffic by using popunder ads? If so, have you considered using Pop Ads? Did you know that you can create short links with Shortest and receive cash for every click on your shortened urls. Start the most interesting journey of your life and learn your ultimate life purpose.